I think it’s safe to say that I am in love with the oxblood color trend this season! These pieces actually photographed a little brighter than their true shade. I really love creating the illusion of a suit with two matching pieces and I’ve been wanting to try it out with this color for awhile. I think it’s really chic and works for different occasions. 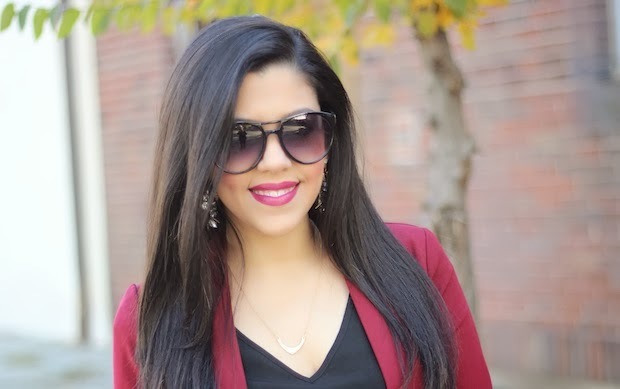 Charlotte Russe is doing a 50 Shades Of Red Campaign since this is one of the hottest color trends of the season, so I was happy to take on the style challenge with one of their boyfriend blazers. (You know I’m all about blazers!) It ended up matching almost perfectly with these Habitual skinny jeans so I knew that I needed to take advantage and finally create this “suit.” It can be really difficult to match two completely different pieces this way so I got really lucky. I have to say that these are superrrr skinnies but they are extremely comfortable with an unbelievable stretch! I paired them with this loose fitted top (that has been a staple for me lately) and these classic black pumps. I really love the gold detailing on the heels. I initially wanted to add a pop of leopard print, but since I don’t have a leopard print bag, I went with this studded one again since it’s such a great statement piece. I think it helped make the outfit pop even more. And I’m actually wearing larger earrings too! I always wear the same studs because typically I’m more of a “statement necklace” girl, but I think this was a nice change. I just have to get used to them because they’re a little heavy on my ears, but these are such a gorgeous pair. And the finishing touch as always is the lipstick and here I combined Urban Decay Shame with Urban Decay Naked. So chic! Can't believe the blazer and jeans are separate and not even from the same store, I really thought it was a suit, but it isn't yet they complete each other so perfectly! Adore your earrings, they are such a great statement piece! Yes, this is so chic! The fit is great and the look is stunning! You've definitely inspired me to look for separates that can be pulled off as a suit. loving the oxblood/burgundy as well. you wore it great. are you getting a bob? i loved it on you! LOoove this look! Your sunglasses and shoes and my favorite. I’m loving this look! So stylish and trendy. I especially adore your blazer. Great taste 🙂 Oh and fabulous accessories!